Last edited by ld_rider; 9th February 2019 at 17:08. 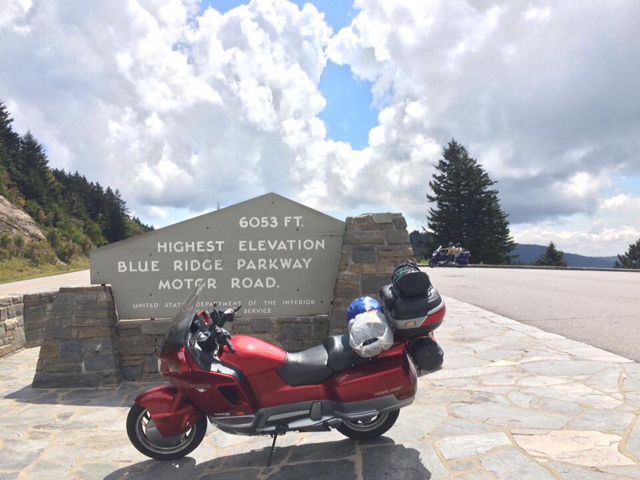 The NC700 is a different bike than the PC800, but it’s a fun ride and because it’s a Honda, so you know it will hold up. Would I go back to a PC800? Don’t think so, but I did enjoy the 10 years of ownership. Last edited by Eric; 10th February 2019 at 17:32. If the NC doesn’t look like it will suit you, you might take a look at a CTX700 instead. Same exact motor and trans in a different configuration. The ergos and pillion possibilities might be a little more like the PC you’re leaving. Just a thought. Commuting on my 2013 NC700X DCT 120 miles a day. Two years ago made 4200 miles, 12 days trip west to Zion, then north to Yellowstone, and then back home. I really like the bike and already planing the route for this year trip to east coast. I'm pretty sure you'll like NC, and you'll like DCT. Lots of PC800 riders (IIRC we called the bike "Pacific Coast" out here) were very dedicated to that bike. I think the NC700 or 750 might serve you well but yes, if you can find one, I think the NT700V might be a more similar bike. I considered one but it was just too heavy for my parking situation, where I have to back the bike out from between cars and a wall, hop a curb and make a tight right turn, etc. Apartment living really limits my choice of bike. The NT700V (called "Deauville" in UK) was sort of the next evolution from the PC800 although designed on a completely fresh piece of paper. It would be more accurate to think of it as a smaller sized ST1300. It has great weather protection with adjustable windshield and integral luggage plus they have deeper lids available that almost double the luggage capacity. The lid locking mechanism was/is the only weak point but most people have figured a way around that problem. Gas mileage is a little bit better than on the PC + it has a good size tank at 5.2 gals. It was overpriced here so was never popular and only brought here in 2010-11. I have a 2010 NT I bought in Dec 2009 so one of the first ones available. It now has 68k miles and has been across the country many times, plus to Nova Scotia, etc. ps. my '97 PC800 was bought new and it had 102k miles on the odometer when I sold it to a friend who continued to ride it daily to work (80-mile round trip) for another 2-years! The passenger seat is about the size of a dinner plate. I like a little more for dinner, iow - I would describe it as the size of a Reader's Digest. But I will probably never have a passenger on mine. I can't say enough good things about this bike. I can say that as far as the low redline goes, that is a plus not a minus. This bike has a lot of low end torque for it's weight despite the dismal-sounding peak horsepower. I have the manual and I get my best mileage when I 'short shift', that is I go into the next gear at a relatively low rpm. Since it pulls good from the start shifting into the next gear at less than 3000 rpms allows me to still take off faster than most cars. That doesn't mean that I race the Camaro that pulls up next to me, I just let them go with the knowledge that they just wasted enough fuel to power my bike for 30 miles. Personally, I think the NC700x would do well for all of your listed scenarios EXCEPT that two up trip with the wife. 5e previous poster’s recommendation of the CTX700 would be even worse in that regard. I had one before my NC and, as much as I wanted to like it, I just didn’t. The cruiser style ergonomics were not ideal for me. Also, the relatively like weight of the bike and small passenger seat would make for a tiring trip for you and the wife after that many miles. For solo rides, both would do well. Two up, I’d look at another bike.